Russia today gave its clearest show of support so far for Libya’s eastern armed forces commander, Khalifa Hafter, flying him by helicopter from Tobruk for talks aboard the Kuznetsov, Moscow’s only aircraft carrier cruising off the Libya coast. 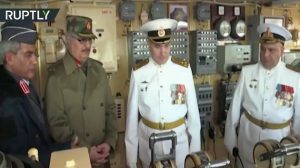 Television footage showed that this was no mere visit: Russian sailors in white dress uniforms paraded for inspection on the huge flight deck as the Libyan and Russian national anthems were played. Hafter watched Sukhoi Su-33 fighters taking off and landing on the carrier deck. Later he accepted a consignment of medical supplies. He also had a video conference on board with Russia’s defence minister Sergey Shoygu. The full content of the discussion was not made public but part of it deal with cooperation on fighting terrorism. But the symbolism of the visit, with the rival UN-backed Government of National Accord (GNA), which Hafter does not recognise, not invited, was lost on nobody. It came just days after Italy made a public show of support for the GNA by re-opening its Tripoli embassy. “Italy (to an extent EU) support one side of the war in Libya and Russia jumps in to support the other side,” tweeted Atlantic Council analyst Mohamed Eljarh. The Kuznetsov‘s arrival became clear yesterday when Moscow warned all aircraft to stay away from an area of Libyan coastal waters. Overnight Tobruk went into security lockdown with roadblocks manned by police and soldiers. The Hafter visit is the latest example Russia’s growing assertiveness in Libya, and follows his most recent trip to Moscow last December. Russia called earlier this month for the UN arms embargo to be lifted for Libya and while not mentioning which side should get the weapons, indicated that they should be at Hafter’s disposal. The House of Representatives’s determination to keep Hafter as armed force commander has so far stymied its acceptance of the proposed Libya Political Agreement which would pass control of the military from parliament to the Presidency Council. The Russian carrier has already made headlines for its very public mission across the Mediterranean to support the offensive to capture Aleppo from Syrian rebels, cementing Moscow’s alliance with Assad and guaranteeing it a Mediterranean warm water port at Tartus. It did not appear from the released footage that there were any civilians in Hafter’s party that went aboard the Kuznetsov. Other officers with him included army commander Major-General Abdul Razzak Al-Nazhuri and air force chief Major-General Saqr Adam Geroushi.